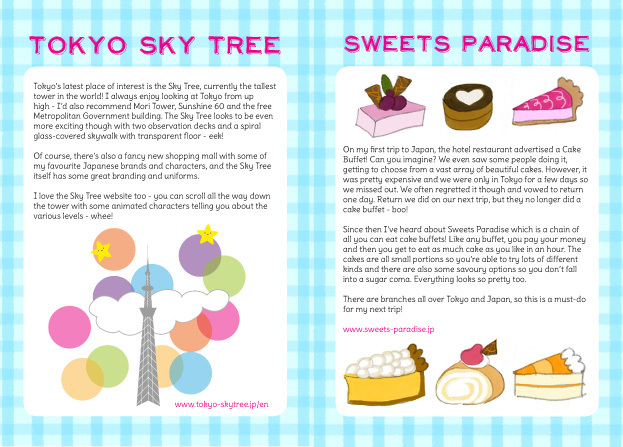 A mini zine of places I want to visit next time in Japan. Apparently three trips to Japan isn't nearly enough - I still have a big wishlist of things to do and places to see. This mini zine describes my top 7 picks including the new Tokyo Sky Tree, Osaka's Instant Ramen Museum, a cake buffet, teapot shopping and the cutest bunny cafe in Nagoya. Each entry comes with doodles and drawings from my sketchbook. 8 pages in full colour. The PDF is set up for viewing on screen in a PDF reader such as Adobe Acrobat Reader or Preview, as well as on e-book readers. It cannot be printed.